Larry Playfair was born June 23, 1958 in Fort St. James, British Columbia. He played his junior hockey with the Kamloops Chiefs and Portland Winter Hawks of the Western Canadian Junior Hockey League (WCJHL). The 6'4" defenseman was drafted in the first round, 13th overall by the Buffalo Sabres in 1978. He spent part of the 1978-79 season with the Hershey Bears of the American Hockey League (AHL). 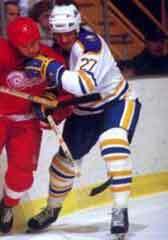 Later that year he was with the Buffalo Sabres and was became a regular NHL defenseman the following season. Larry was paired up with Mike Ramsey early in his career and they went on to form a steady and tough defense tandems. Larry was an important part of the Buffalo teams during the 1980s, spending 8 seasons there on defense. In January of 1986, Playfair was traded with Ken Baumgartner and Sean McKenna to the Los Angeles Kings for Brian Engblom and Doug Smith.He played a couple of seasons with the Los Angeles Kings before being traded back to the Sabres for a draft pick in October 1988. His return to Buffalo lasted 46 games and Larry retired in 1990. Since his retirement from pro-hockey, Larry Playfair has been involved with several charities and the Buffalo Sabres alumni association.